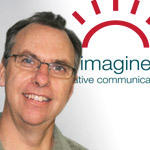 Graphic Designer Craig Fairley | Burlington Ontario | Imagine Creative Communications Inc. The president and creative director of Imagine Creative Communications is Craig Fairley, a creative thinker grounded in systematic approaches to problem solving. He has fifteen years of experience in graphic design and marketing communications. His amazing designs and creative solutions continually impress his clients-and their clients. Craig’s talent lies in being able to listen, understand what the client is all about, then turn that understanding into creative solutions that help them achieve their goals. Prior to becoming a graphic designer, Craig was involved in public sector management with varying responsibilities that included: customer service, employee communication, training, systems project management and purchasing. Since establishing Imagine Creative Communications, he has steadily grown the business by building collaborative relationships with each client and offering outstanding identities and design, promotional strategies and marketing collateral. Craig has a master of library science degree and worked as a librarian for 12 years. While a career switch from libraries to marketing seems to be a great leap, there are many similarities. As a librarian, his job was to understand the client’s real needs – not necessarily the question they asked – interpret those needs and find a solution that fit. Sound a bit like marketing? He thinks so. A life-long learner, Craig is committed to keeping abreast of industry trends, techniques and technology. He has also studied adult training and development. Craig also has a passion for Home of Grace Care Centre, an orphanage in rural western Kenya. He and his wife began supporting it in 2009. Shortly thereafter, they formed a small nonprofit with a group of friends in order to channel their work. In 2013 Home of Grace become a project of Ontario charity Speroway. He and the board continue to work as an advocacy and fundraising group on behalf of Speroway. He has visited the orphanage in 2012 and 2014. He also regularly volunteers in his community, feeling there is a need to help out both locally and globally. Craig is a member of Communicators Connection, a network of entrepreneurs involved in all aspects of business communications.